Usually when I present these interviews with my favorite television actors, I begin by describing the subject’s personality and technique, and some of his or her best roles. In the case of Shirley Knight, a detailed introduction seems unnecessary. An ingenue in Hollywood since her twenty-first year, she remains one of our most prominent character actors more than five decades later. The honors that Knight has received include two Oscar nominations (for her third and fourth films), a Tony Award, and eight Emmy nominations (of which she took home three). The chronology of those accolades aligns neatly: first the Oscar nominations in 1960 and 1962, for her third and fourth features; then the Tony in 1976, for Kennedy’s Children; and finally the Emmy recognition beginning in 1981, for an adaptation of Arthur Miller’s Playing For Time. But Knight’s actual career is not a linear progression from film to stage to television; she has alternated, without stop, in all three media. In between starring in movies like Petulia and The Rain People, and interpreting Chekhov and Tennessee Williams on the stage, Knight guest starred in over 150 television episodes and made-for-TV movies. 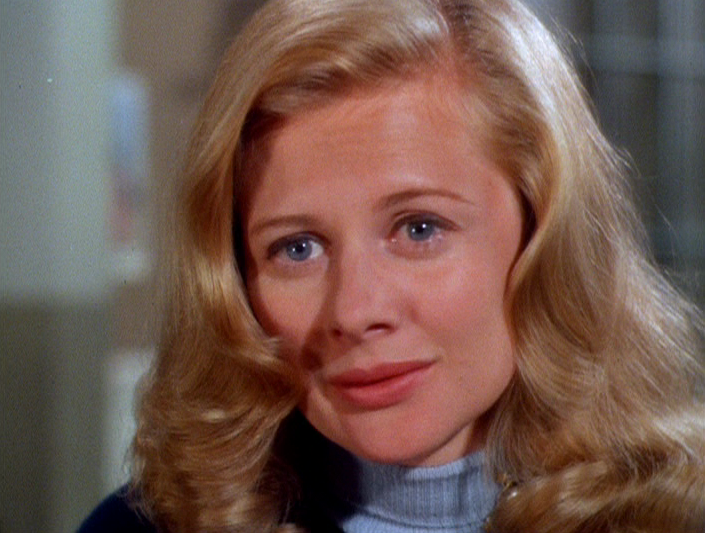 In a recent interview, Knight took time to discuss her early television work. These were roles she played before the Television Academy began to take notice, but they include classic shows like Playhouse 90, Maverick, The Fugitive, and a segment of The Outer Limits (“The Man Who Was Never Born”) that has entered the canon as one of the finest science fiction programs ever done on television. Do you remember your television debut? The first thing I ever did was called NBC Matinee Theater [on October 29, 1957]. It was an hour, live television original play, every day. It was one of the first things in color. I played a fifteen year-old unwed mother that Michael Landon had got pregnant. The great Marsha Hunt played my mother. Do you have any memories of Michael Landon? Oh, of course, and in fact we became very good friends. Shortly after that I married Gene Persson, and he and his wife and my husband and I were very good friends, and saw each other socially a lot. And then I moved to New York and divorced my husband, and he divorced his wife. I never saw him after that. One time he asked me to do his show [Little House on the Prairie], and I wasn’t available. I felt kind of bad, because I thought it would be fun to see him again. There are internet sources that place you in the cast of Picnic, in 1955. Is that accurate? Oh, my goodness, that is right. I’m from Kansas. I come from a teeny, teeny little place called Mitchell, with thirteen houses, and I went to a two-room schoolhouse and all that. They shot Picnic in a town about fourteen miles where I grew up, and they wanted a bunch of kids to be around the lake in Sterling. The town was called Sterling Lake. So my mom took the three of us – I had a sister and brother – and we went and we were extras for the day, sitting on the beach by the lake. At one point my mother, who was always very concerned about us never getting sunburned, because we were all towheaded white people, went up to who she thought was the boss – and it turned out he was, Joshua Logan. She said, “My children need water. And they also need to be in the shade.” They were just letting us sit, in between shots. He trotted us over, gave us water, and kept us out of the sun until it was necessary for us to go back. Do you know if you’re actually visible in the film? No. I remember seeing the movie when it came out, and at that point I was just going to the movies and I probably didn’t even assume we were in it. And probably didn’t care. How much professional work had you done prior to that Matinee Theater? That was my first professional job, that I was paid for. I studied to be an opera singer. That was really what I was going to do. I went to Los Angeles to take a summer acting course with the Pasadena Playhouse, for my singing. That was between my junior and senior year in college. Somebody saw me and acted as my agent, and that was how I got the NBC Matinee Theater. It turned out he wasn’t a very good agent, and I quickly dismissed him. But that’s how I got that first job. Now, I had no idea that I was any good at what I was doing. I just was obviously an instinctive young woman. And I had sung my whole life, so I certainly know how to perform. But I needed to study acting, and my new agent suggested that I study with Jeff Corey. Another blacklisted person. In my acting class with Jeff, this was our group: Robert Blake, Bobby Driscoll, Dean Stockwell, Jack Nicholson, Sally Kellerman, Millie Perkins. The main thing that happened as a result of that class is that [some of us] decided to do Look Back in Anger. We did it in a little teeny theater on Sunset Boulevard, across from the Chateau Marmont, in that Jay Ward animation building. There was a little theater in there. I played the lead, and Dean Stockwell played opposite me, and Bobby Driscoll played the other part. Robert Blake directed it. A lot of people came, because Dean Stockwell was very famous at that time. He had just done Sons and Lovers, and all sorts of films. One person that came to see it was Ethel Winant, who was the head of casting at CBS, and Ethel really was the person who, more than anyone else, championed my career. She would put me in everything. Anything she could possibly put me in that was at CBS, she did. She also was responsible for my going with the Kurt Frings Agency. If you don’t know who that is, he was the most important Hollywood agent for women. He handled Elizabeth Taylor, Audrey Hepburn, Grace Kelly, Eva Marie Saint. Every star at that time was his client. At that time, under the studio system, what they would do is put people under contract for six months, and if they did okay, that would be great. If they didn’t, it didn’t matter. Now, I was still living at the Hollywood Studio Club. They took me to MGM and they offered me a six-month contract for $400. And they took me to Warner Bros., where they offered me a contract, and it was $400 also. [Frings] thought I should go with MGM, but for some reason, I didn’t feel comfortable there. I liked Warner Bros. And Warner Bros. was the first studio that was doing all the early television. So I was put under contract, and it turned out that the man, Delbert Mann, who had directed me on “The Long March” was going to direct the film of The Dark at the Top of the Stairs. So I read for him, but he already knew me, and he put me in as the little fifteen year-old girl, and I was nominated for an Oscar. And that really propelled me, obviously. “The Long March” was your first of two Playhouse 90s. Jack Carson was in it, and Rod Taylor. I played a young woman whose husband was killed in the second world war. It also had Sterling Hayden. A fabulous actor, a wonderful person. So after he had said this information, and after he told me my husband died, Rod Taylor and I improvised. I was crying, and went on and on with my sadness, basically. It was terrifying, but in a way it was very exciting to mean that you were improvising Playhouse 90 in front of a lot of people out there, and hoping that you did well. Afterward everyone was so impressed and kind about what the two of us had done. So we felt like we did well. What else do you remember about Sterling Hayden? He was a quiet man. Rather reserved. I could tell that he was very fond of me. Of course, I was very young, and he was much older. But what a wonderful, wonderful actor, just a marvelous actor. Do you mean that he was interested in you romantically? Oh, no, not at all. But he admired me as a young woman. He liked me, he spoke to me. I remember we talked about books, because I’m an avid reader, and I read absolutely everything, whether it’s fiction or non-fiction. I remember us talking about literature. Do you remember any specific books that you discussed? Can you characterize how Delbert Mann worked as a director? Very kind, very gentle, very clear about what he wanted. He was a very different kind of director, because often directors can be short, especially in television. There’s so much to do, and you do it so quickly. He never rattled. I’ve worked with a lot of really great directors, and they all worked differently, and some of them could get rattled. Certainly Richard Brooks was one of those people. He would scream a lot. But on the other hand he was also a wonderful director, and I liked him a lot. And “The Long March” led to your first Oscar-nominated film role, in The Dark at the Top of the Stairs? 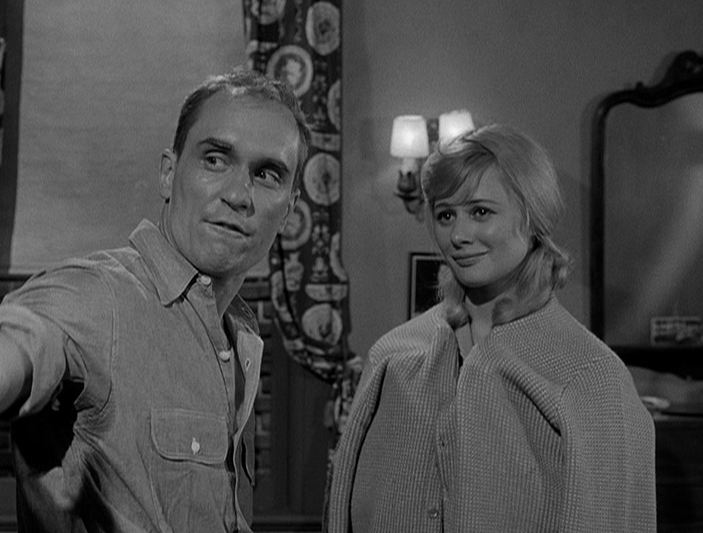 Knight appeared in a Naked City episode (“Five Cranks For Winter … Ten Cranks For Spring,” 1962) with her future co-star in The Rain People (1969), Robert Duvall. Yes, with Franchot Tone playing my father. It was written by Horton Foote, and that was the first time I worked with him. I played the daughter that wanted to be an opera singer and got spinal meningitis. With spinal meningitis, you go a little bit crazy, and so I had this scene where I sang an aria and went crazy. Which was wonderful, because that’s the only time I ever got to use my musical skills. Really? In your whole career? Well, I’ve done a couple of musicals, and I’ve done recitals of serious music. But when I was coming up, it was all things like Hair. I think if I was young now, there would be some marvelous parts for me. What was it like being a Warner Bros. contract player? Well, you did what you were told. You were never out of work. What would happen there was, for example, I would be doing a movie and if I had a week off, they would put you in Sugarfoot or Maverick or Cheyenne, or The Roaring 20s or 77 Sunset Strip. So I did masses of the Warner Bros. television shows. Literally, you would go do – I remember doing a really terrible film called Ice Palace, with Richard Burton and Robert Ryan. I would have time off [in between my scenes]. If I did a couple weeks on the movie and I had a week off, they would put me in a Roaring 20s, or any of those shows. They used you so much when you were under contract, they would put a wig on you. A couple of times I wore a black wig or a red wig, so that I wouldn’t be so recognizable, evidently. You had your own little house on the lot, which are offices now, but it used to be you had your own little kitchenette and bed and bathroom. And that was good, because you were there a lot. I was friends with the other contract players – Roger Moore and James Garner and the girl that did The Roaring 20s, Dorothy Provine. We were friends, and we would sit around and talk. Did you have a boss at Warners? Who decided that you were going to do a Maverick one week and a SurfSide 6 the week after that? Well, the guy who was in charge of the whole television department, Bill Orr, was Jack Warner’s son-in-law. Also, there was a television casting person, Jack Baur. You would be called by him. He’d say, “Oh, you’re doing this this week, and here’s the script.” and so on. They probably all sat around the table, I would think, and they would say, “Well, the little bouncy girl, Connie Stevens.” They would put her in all those parts, and then I would be in the more serious parts. They had one of each. There was always a lady, either a daughter or a woman in distress, if you think about it, in all of their shows. So I was perfect, in a sense, because I was more of a chameleon than the other girls under contract, Dorothy Provine and Connie Stevens, who were particular types. And then of course they would put people in series [as a regular]. But they didn’t put me in a series, and my theory was that I was already known in movies. And I was kind of popular. At that time, that was my fifteen minutes of fame, or whatever. So they didn’t want to [cast me in a running series] because there really was a clear divide. You were either a movie actress or a television actress, in terms of promotion. Do any of your roles in the Warners shows stand out in your memory? I really enjoyed the Maverick. 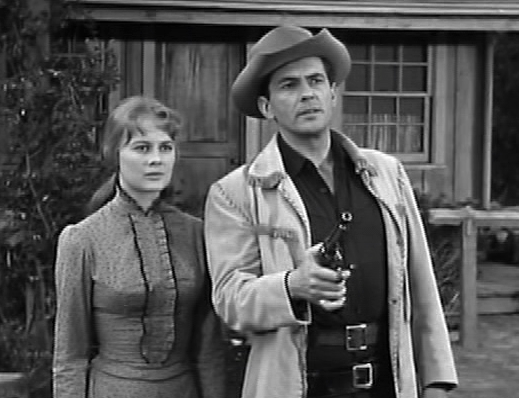 Some of the western shows were fun, mainly because of the costumes. On the other hand, it was awfully hot to do them, because we used to go to the Warner Bros. ranch. That was where Warner Center now is in Woodland Hills. On Maverick (“The Ice Man,” 1961) with Jack Kelly. As a contract player, were there other things you had to do besides act? You wore Joan Fontaine’s old dress to the Oscars? Yes. Fabulous, just fabulous, and so beautiful. You wanted to take it home, but of course you took it back to the studio the next day. But they really took good care of you. I mean, one time I was very cross, because I was just nominated for my second Oscar, for Sweet Bird of Youth, and Jack Warner thought, “Well, I guess we’d better just throw her in a couple of movies because [of the nomination].” And instead of putting me in something wonderful he put me in this women’s prison movie, House of Women. Then he put me in The Couch, which was a psycho thriller written by Robert Bloch, who wrote Psycho. But at any rate, I was really cross, and because they fired the director [Walter Doniger] on the prison movie, and we had this horrible producer and I shouted at him and said, “You know, he’s good, and why are you . . . ?” I mean, I was a feisty little thing. And I was taken to Jack Warner’s office, and I was sat down. He said, “I am only going to say this once. I do not want another Bette Davis in my studio.” I was terrified! And I thought, okay, I get it. I am to do what I am told, and that’s that. Something happened, really, when I did Sweet Bird of Youth. I was working with Geraldine Page and Paul Newman and Ed Begley and Mildred Dunnock and Rip Torn and Madeleine Sherwood, all these New York people who were all part of the Actors Studio, with the exception of Ed Begley. And I really felt that I wanted to know more than I knew. That’s the best way I can put it. So in 1964 I asked to be released from my contract at Warners, and they let me go, and I moved to New York and then I started doing many, many, many more television plays. They would fly me to California constantly, and I would do things like The Invaders, and I did practically one every year of The Fugitive, and that wonderful science fiction thing, The Outer Limits. “The Man Who Was Never Born” is one of the shows that made me want to interview you. Isn’t that extraordinary, that show? I mean, people still talk about that particular show, and they actually stole the plot for one of the Terminator movies. What do you remember about making that episode? I just thought it was an amazing show, and story, and I loved working with Marty Landau. He and I were friends, and in fact, he and his wife Barbara [Bain] were the two people who stood up with us at my first wedding, to Gene Persson. The Outer Limits Companion mentions that Landau had been your acting teacher. I took a few classes with him. I think it was after I was studying with Jeff Corey, or at the same time. He said, “I have a class,” and I said, “Oh, okay, I’ll start coming.” Because I would do almost anything to learn. I mean, when I was doing the film Sweet Bird of Youth, I actually did a play at night. I was doing Little Mary Sunshine in the theater. So I was like this person who never stopped. The Energizer Bunny, I guess. At any rate, that was a wonderful show. I remember, in particular, the cameraman, Conrad Hall, because he was different from the other camera people that I had worked with on the Warner Bros. shows, which were very utilitarian. Very simplistic. One of the reasons that I was so impressed with Ida Lupino as a director is that she was one of the first television directors that I worked with that I thought, oh, she’s different. Her shots are different, her ideas are different. And I felt very much that about Conrad Hall. He was very careful. He took a lot of time. I remember in particular the scene by the lake, where I’m sitting. That was so beautifully shot. You have a remarkable chemistry with Landau in that show. How did the two of you achieve that? It was easy. That’s a strange thing to say, but what I mean by it is that when you work with actors that are really with you and listening to you and responding to you, it’s so easy and comfortable. Everything just seems right. When that doesn’t happen, it’s as if you’re striving for that, you’re trying to connect with someone and they’re not quite coming with you. I always say there’s only one pure state of acting, and that’s when you don’t know what you’re going to say and you don’t know what the other person’s going to say, and you don’t know what you’re going to do and you don’t know what they’re going to do. That’s why the best acting is dangerous, where the audience is sitting at the edge of their seat instead of being comfortable. How often are you able to achieve that state when you’re working? All the time, or just when everything is going right? Well, I think all the time, because if I’m not, I stop and start again. Or if there’s a distraction, or if another actor isn’t coming with me, I try to get them to come with me. You need to be very relaxed, and you need to not care about what happens. I think the thing that gets in people’s way most of all is that they want it to be perfect. And you can’t do that. You have to be in a place where you’re just, “Well, whatever, I’m just going to be here and I’m going to respond and allow whatever’s happening to penetrate me, so that I can respond.” You can’t be in that place of fear. You have to be, as an actor, fearless and shameless. And then it works out. It’s a very fine line, it really is, and it’s so difficult to describe. You just have to be in that place. If the director is giving you direction, for example, you have to hear that, and then you have to let it go. It can’t be in your head while you’re acting. You guest starred on Johnny Staccato, with John Cassavetes. You mentioned your three appearances on The Fugitive. What was your impression of David Janssen? I loved him. He was so sweet. I felt sorry for him toward the end. Now they have several people as leads in a show, they have these huge casts, but David was that show. By the last season, that poor man was just beat. And he had a problem with alcohol, and I think it escalated in that last year. And I was convinced that some of it had to with the fact that the poor man was just overworked. He had those long, long, long hours, and a role where he was always doing physical things. There was one that was so rough, where we were handcuffed together for the whole show. Knight played a blind woman on The Invaders (“The Watchers,” 1967), one of many QM Productions on which she was a guest star. You worked for the executive producer of The Fugitive, Quinn Martin, on a number of other series. I liked him very much, and he liked me very much. You know, most of the producers cast those shows. There weren’t casting directors. They would just send you the script and call up your agent and say, “Does Shirley want to do this?” I didn’t audition for anything. But more than that, if you had a good relationship with a director or a producer like Quinn, they hired you a lot, because they don’t want to waste any time. The best way to explain it is, they shot so quickly, and [they hired you] if you were an actor who comes up with the goods right away, somebody who [when the director] says cry, you cry. Whatever you do, you’re quick. Because you’re skilled. There are actors – I don’t want to name any, but there are many – who are like, oh, could everybody be out of my eyeline, and all this nonsense. Do you remember Joan Hackett? Someone once told me a similar story about her, that she required a part of the soundstage to be masked off with black curtains so she wouldn’t be distracted. I loved Joan! We did two things together. We did The Group, and when I was living in England, I was asked to do John Dos Passos’s U.S.A. for PBS. Joan was in it. I stayed with her [in Los Angeles] because her husband, Richard Mulligan, was out of town, and I really hated the hotel I was in. She said, “Well, come and stay with me.” So the whole time I did the show, I stayed with her and we had so much fun. Except she was always feeding me these drinks with ground-up green beans, which were horrible. Joan was a model, and I don’t think she ever studied acting. So she was a bit insecure, I think, particularly in the beginning. And she was very particular. One time we had to roll around on the floor, and the director of U.S.A., George Schaefer, says, “Tomorrow, girls, you maybe should wear jeans or something.” And Joan says, “I don’t wear jeans.” Which gives you some idea. She was always immaculately, perfectly dressed. She wore trousers that day, but not jeans. A lot of actors who achieved success in movies, as you did, made a decision to stop doing television. Did you ever consider doing that? No. But I’m one of those weird people: I’ve never had a press agent, I’ve never been self-aggrandizing. I have rules about the theater. I don’t play supporting roles in the theater, because it’s ridiculous. I don’t have time for that. But I don’t really care if it’s a supporting part in a TV show or a movie, if I like the character. 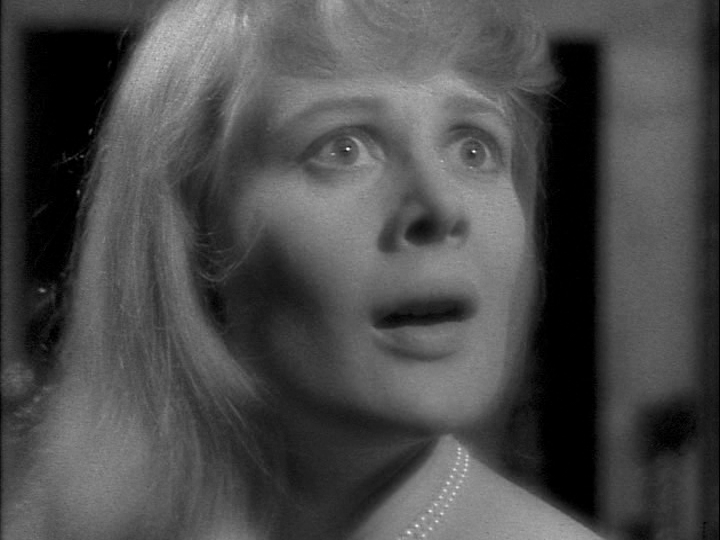 The other television thing I’d like to quickly talk about, because it was such a great piece, was the Playhouse 90 I did by Ingmar Bergman, The Lie. [The Playhouse 90 title was revived by CBS for certain dramatic specials, including this one from 1973.] I was very thrilled that Ingmar Bergman felt that I was the person to do the piece, and that was thrilling for me, because evidently he’d seen Dutchman and was very admiring of it. Alex Segal was a great director, another crazy person who could be not very nice at times. But never to me. In fact, I stayed with his wife and he while I was doing the show. George Segal was very good, I thought, and Robert Culp was very good, for those roles. I felt it should have won everything, but because a whole bunch of flipping Southern television stations wouldn’t run it– did you know that? Well, it’s pretty rough. At one point I’m beaten and there’s blood all over the place. They felt it was too hot, I guess, or too scary for the populace. And as a result, CBS didn’t put it up for any Emmys or anything else, and that was tragic because it should have won everything. It is absolutely brilliant. What made Alex Segal a good director? He was one of those geniuses. I’ve worked with four or five genius directors. He was one of them. He had such insight. He would never direct you, in a sense, but he would say, “Think about this. Think about that.” He reminded me quite a lot of Burgess Meredith, who was one of the best directors I’ve ever worked for. Burgess directed Dutchman. He didn’t direct the film, but he basically directed the film, because we did his direction. Had he directed the stage version? And he was right most of the time? Oh, of course. I was having trouble with the sensuality in the part, and he took me to the Pink Pussycat in Los Angeles and had me take a strip-tease lesson. Then he had me buy underwear and a tight dress from Frederick’s of Hollywood. I was one of the producers, and I literally was going to fire myself, because I wasn’t getting it. And after I had my strip-tease lesson and my clothing from Frederick’s, I got the part. Are there any other television directors you want to mention? You know who I worked with who was a very good director? He was killed by a helicopter blade . . . .
That’s remarkable, in a way, that after two Oscar nominations you would uproot yourself and sort of start over again with Strasberg. I had moments of regrets, but not really. Because most of what I would call my extraordinary work has been in the theater. Which means that I haven’t seen your best work. Oh! Well, let me put it this way. My Blanche in Streetcar – I was absolutely born to play that role. Tennessee came backstage and said, “Finally, I have my Blanche. My perfect Blanche.” And then he sat down and wrote a play for me. That was thrilling. Also, I think my Cherry Orchard was probably definitive. I was pretty darn good in Horton Foote’s play, Young Man From Atlanta. And Kennedy’s Children; I certainly did that part well. And are there any other actors you worked with in television that we should talk about? So I felt like, oh, my god, I can’t see, I can’t ride a horse – the man hates me! I think later on he sort of patted me on the shoulder, you know how older men do: Oh, well, she doesn’t know any better, and sort of pat you on the shoulder. But I remember at the time being incredibly humiliated. By the way, I never did wear contact lenses, until they got soft. So in most of the films and TV performances we’ve been discussing, you couldn’t see anything around you while you were performing. There’s another actress of my calibre that I admire very much, Vanessa Redgrave, and she’s absolutely blind as a bat as well. And Ingrid Bergman was blind without her glasses, and she did all those films and couldn’t see a thing. My theory is that you cut out a lot because you can’t see, and your imagination is really working because you can’t see. Poor eyesight helped your concentration. Perhaps if you had been able to see well, you would’ve required them to block off your eyeline, like the actress you mentioned earlier. Trust me, I would never be like that actress, because number one, she’s not a great actress, and I am. [Laughs.] There’s a difference. So I would never be like that. I love it that you have no compunction about referring to yourself as a great actress. Clearly, when Ingmar Bergman asked you to do The Lie, you were aware of his work and his reputation. Were you a cinema buff? Oh, I love old cinema. And you know, the only time I become frustrated with directors, especially when they’re young, and often television directors, I just want to say to them: if you want to learn how to do this, go and look at Eisenstein. Look at Ingmar Bergman. Look at the Italians – Fellini and Rossellini. Look at Kurosawa’s films. And the wonderful American filmmakers. Orson Welles, when he was going to direct his first film, spent six months looking at movies, old movies by geniuses. I just think if you want to be a part of that extraordinary world of this great art, then I think it behooves you to watch. You learn so much if you watch Ingrid Bergman act on film, or Bette Davis. You don’t learn much if you watch Katharine Hepburn. You learn, oh, don’t do that, because that’s over the top! 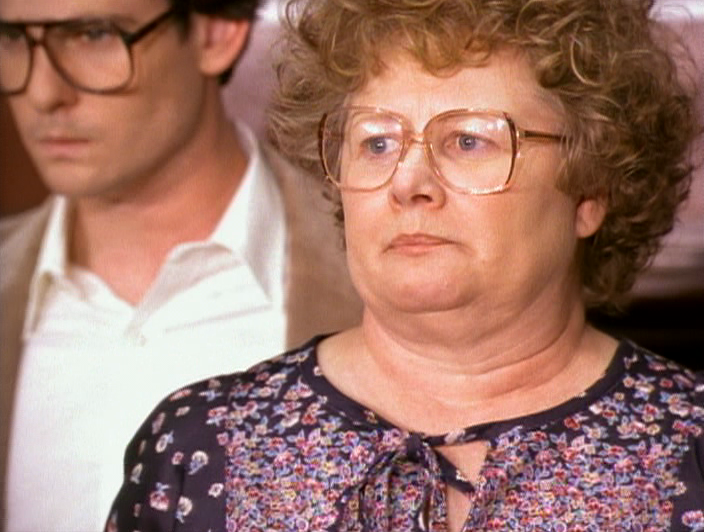 Knight (with Henry Thomas) won an Emmy for Indictment: The McMartin Trial, one of her favorite television projects. In the same year (1995), she won a second Emmy in another category, as a guest star on NYPD Blue. Tags: Al Freeman Jr., Alex Segal, Boris Sagal, Burgess Meredith, character actors, Conrad Hall, David Janssen, Delbert Mann, Dutchman, Emmy Awards, Gene Persson, Horton Foote, Hot in Cleveland, Ingmar Bergman, Interviews, Jack Carson, Jack Warner, Joan Hackett, John Dos Passos, Joshua Logan, Kansas, Live Television, Martin Landau, Matinee Theater, Maverick, Michael Landon, movie stars, Picnic, Playhouse 90, Quinn Martin, Rod Taylor, Ronald Reagan, Shirley Knight, Sterling Hayden, Sweet Bird of Youth, television actors, television actresses, The Dark at the Top of the Stairs, The Fugitive, The Lie, The Man Who Was Never Born, The Outer Limits, Warner Bros.
A superb interview, Stephen. Thank you. One small note: PLAYING FOR TIME isn’t so much an “adaptation of Arthur Miller’s PLAYING FOR TIME” as it is a teleplay by Arthur Miller, adapted from Fania Fénelon’s memoir “The Musicians of Auschwitz.” The once controversial PLAYING has been difficult to see for some years; I notice that Olive Films is bringing it out on DVD this Fall. Er, thank you, Griff. I see that the stage version of PLAYING FOR TIME did indeed follow the telefilm. Great interview of a great actress. I met Shirley at a thanksgiving dinner at my family’s house in marina del rey, ca. Her uncle bob Webster was married to my great aunt Ruth.